Talk about a gift that keeps on giving! This little gift box candle is one hot item and it’s sure to add a classy and memorable touch to your day. Sold only by Fashioncraft, each Gift Box Collectionscented candle favor measures 1 ¾” tall x 1 ½” wide and remarkably resembles an exquisitely wrapped gift in a classic blue and brown damask design with a solid brown lid, finished with a blue ribbon wrap and bow centered at its top. 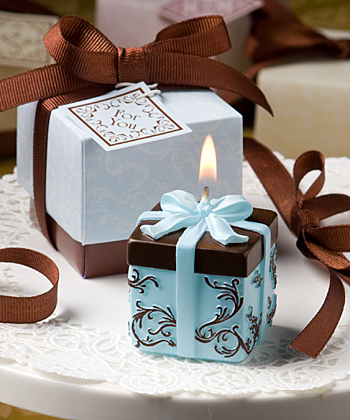 An elegant present that makes a great addition to any festive occasion, each gift box candle favor comes beautifully packaged in a two piece box with a blue and white damask design top and chocolate brown base, wrapped and tied with a brown satin ribbon and an attached matching design “For You” tag.